Douglas Richardson, the Director of Imaging for the Harvard Center for Biological Imaging (HCBI), has made a big impact on MCB despite being relatively new to both Harvard and the United States. An Ontario native, Richardson started at Harvard in 2013. His dedication to his responsibilities maintaining the department’s many pieces of imaging equipment, writing articles, lecturing, and helping set up student experiments impressed the department so much, that this year he won a coveted Harvard Hero award for going above and beyond the call of duty for his job. The awards are given each year to employees across the university who are nominated by their peers for outstanding contributions to their department. Richardson earned both his bachelor’s and his PhD at Queen’s University in Kingston, Ontario, where he also met his wife Mary. He started by studying life sciences as an undergrad, before being recruited to the Department of Pathology and Molecular Medicine by his future graduate student supervisor, Dr. Lois Mulligan. At the Cancer Research Institute there, he helped Dr. Mulligan with her work on the role of the RET protein in thyroid cancers. “Towards the end of my PhD I started looking around at where I thought the technology was going, and where there were some really good spots to continue in biology but also get a lot more exposure to the technology,” Richardson said. His search led to a post-doctoral fellowship with the Nobel Prize-winning physicist Stefan Hell at the Max Planck Institute for Biophysical Chemistry in Göttingen, Germany. Hell won the Nobel in 2014 for his work on super-resolved fluorescence microscopy, and Richardson was given hands-on experience with this innovative work. In Göttingen he found advanced equipment beyond anything he had seen at his small university, but also a number of unexpected similarities. “[Göttingen] was basically the same size as Kingston, where we were living in Canada, and there was so many similarities between the two towns it was scary,” Richardson said. “They are both university towns, but there were also these really random quirks. Like there was a huge aluminum plant, and it was the same aluminum company, both in Kingston and Germany. Then there was a big prison right outside of town, and Kingston was surrounded by about six of Canada’s largest prisons. Great place to put a university!” he joked. Richardson worked on two main projects in Göttingen, while his wife taught English. The first was a collaboration with Alice Ting’s lab at MIT, using super-resolution microscopy to image living cells enhanced with fluorophores. The second project has a paper still under revision, and involved using super-resolution to image the pH in endosomes in cells. Richardson acknowledges that his three-year stint at the Max Planck Institute was short by post-doc standards, but he and his wife wanted to be closer to home in order to start a family. Their first child was going to be born soon after they moved back, so Richardson began looking for work. 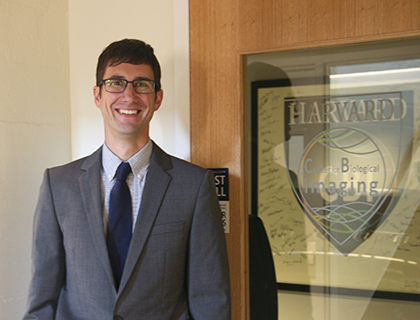 Richardson’s enthusiasm for cutting edge imaging technology has influenced not only his career path, but also earned him the respect of the entire MCB community, resulting in the overwhelming number of nominations for the Harvard Heroes award. “I think one of the coolest parts about it was that the people who nominated me for it were a number of faculty members in the department. It was kind of crazy to get congratulatory emails from very distinguished Harvard faculty members,” Richardson laughed. “Doug is truly a hero. He embodies how well-run and cutting-edge facilities can support all labs in our community,” said MCB Chair, Professor Alex Schier. The HCBI facility began growing about five years ago when funds were secured to add a wide range of new imaging equipment. The rapid expansion of the facility’s capabilities necessitated bringing on an employee like Richardson. All of HCBI’s scopes are leased from Carl Zeiss, the German optical instruments company. Any large repairs or maintenance tasks are done by local Carl Zeiss representatives, and the scopes are upgraded every two or three years. “This was probably one of the biggest reasons I came here, because I knew it wouldn’t be a facility where I would come in and five years later it would be obsolete and I’d be looking to go somewhere else,” Richardson said. Last year Richardson wrote a review article for the journal Cell, co-authored by Lichtman. In it they describe the process of tissue clearing, which involves treating biological tissues with chemicals in order to overcome light scatter and allow for thicker specimens to be imaged. Instead of thin sections of tissue that have to be pieced together later, the researcher can see a more complete picture of whatever they are sampling. Besides his duties helping with the equipment, Richardson also assists with teaching. He hosts about fifteen lunch and learn sessions a year, where an interesting topic in microscopy is chosen for an informal lecture series. He contributes to Lichtman and Professor Ethan Garner’s MCB 68 course, Cell Biology Through the Microscope, by giving a few lectures on the equipment for the course. He also organizes an annual workshop to teach tissue clearing methods to MCB students. For the future, Richardson hopes to make several improvements to HCBI’s services to students and researchers. For example, since the huge data sets that result from most imaging projects use a large amount of memory, they can’t be analyzed on most people’s laptops. There are a few processing computers outside Richardson’s office which are intended to host licensed image processing software, but are often used just for their RAM. This summer, he hopes to set up a virtual machine on the Harvard cluster computer for running ImageJ software, a free processing software that most students use. This would allow researchers to run the program from their laptops from the comfort of their homes or labs. Initiatives like these are part of what makes his job interesting for Richardson, and he says he does not miss the opportunity to run his own lab. “The big thing that always scared me about having my own lab was not so much writing grants to support myself, but knowing that there were students and post-docs that were relying on me to find funding for them. That really worried me,” he said. Richardson’s academic career has not followed a traditional path, but it has led him somewhere he is needed. Those who benefit from Richardson’s patience and expertise are quick to praise his contributions to MCB. “I am so pleased to hear that Doug has been chosen as a Harvard Hero. Doug’s work in the Harvard Center for Biological Imaging has helped my lab enormously,” said Professor Susan Mango.